Valplast - Lab Depot ltd.
We believe the future of dentistry lies in metal-free restorations. 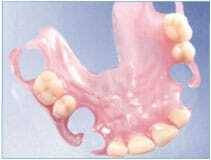 Valplast Flexible Partials are unbreakable, removable partials that many people find comfortable. They’re almost invisible, and eliminate the need for metal clasps. Most Valplast Flexible Partials are fabricated without the use of a metal frame – made instead from a strong, durable plastic that snaps securely and comfortably into place around existing natural teeth and gums. 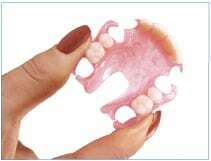 The plastic used is so strong that the partial made from it can be very thin, eliminating that heavy, bulky feeling that make wearing partials unpleasant.